Not to be confused with Hemorrhagic disease of the newborn. Hemolytic disease of the newborn, also known as hemolytic disease of the fetus and newborn, HDN, HDFN, or erythroblastosis fetalis, is an alloimmune condition that develops in a fetus, when the IgG molecules (one of the five main types of antibodies) produced by the mother pass through the placenta. Among these antibodies are some which attack antigens on the red blood cells in the fetal circulation, breaking down and destroying the cells (hemolysis). The fetus can develop reticulocytosis and anemia. This fetal disease ranges from mild to very severe, and fetal death from heart failure (hydrops fetalis) can occur. When the disease is moderate or severe, many erythroblasts (immature red blood cells) are present in the fetal blood, and so these forms of the disease can be called erythroblastosis fetalis (or erythroblastosis foetalis). HDFN represents a breach of immune privilege for the fetus or some other form of impairment of the immune tolerance of pregnancy. Various types of HDFN are classified by which alloantigen provokes the response. In order of incidence, the types include ABO, anti-RhD, anti-RhE, anti-Rhc, anti-Rhe, anti-RhC, multiantigen combinations, and anti-Kell. Hemolysis leads to elevated bilirubin levels. After delivery bilirubin is no longer cleared (via the placenta) from the neonate's blood and the symptoms of jaundice (yellowish skin and yellow discoloration of the whites of the eyes) increase within 24 hours after birth. Like any other severe neonatal jaundice, there is the possibility of acute or chronic kernicterus. Profound anemia can cause high-output heart failure, with pallor, enlarged liver and/or spleen, generalized swelling, and respiratory distress. 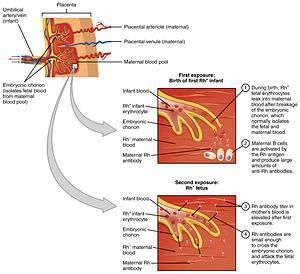 The prenatal manifestations are known as hydrops fetalis; in severe forms this can include petechiae and purpura. The infant may be stillborn or die shortly after birth. Fetal-maternal hemorrhage can occur due to abortion, childbirth, ruptures in the placenta during pregnancy, or medical procedures carried out during pregnancy that breach the uterine wall. In subsequent pregnancies, if there is a similar incompatibility in the fetus, these antibodies are then able to cross the placenta into the fetal bloodstream to attach to the red blood cells and cause hemolysis. In other words, if a mother has anti-RhD (D being the major Rhesus antigen) IgG antibodies as a result of previously carrying a RhD-positive fetus, this antibody will only affect a fetus with RhD-positive blood. The woman may have received a therapeutic blood transfusion. ABO blood group system and the D antigen of the Rhesus (Rh) blood group system typing are routine prior to transfusion. Suggestions have been made that women of child bearing age or young girls should not be given a transfusion with Rhc-positive blood or Kell1-positive blood to avoid possible sensitization, but this would strain the resources of blood transfusion services, and it is currently considered uneconomical to screen for these blood groups. HDFN can also be caused by antibodies to a variety of other blood group system antigens, but Kell and Rh are the most frequently encountered. The third sensitization model can occur in women of blood type O. The immune response to A and B antigens, that are widespread in the environment, usually leads to the production of IgM or IgG anti-A and anti-B antibodies early in life. Women of blood type O are more prone than women of types A and B to making IgG anti-A and anti-B antibodies, and these IgG antibodies are able to cross the placenta. For unknown reasons, the incidence of maternal antibodies against type A and B antigens of the IgG type that could potentially cause hemolytic disease of the newborn is greater than the observed incidence of "ABO disease." About 15% of pregnancies involve a type O mother and a type A or type B child; only 3% of these pregnancies result in hemolytic disease due to A/B/O incompatibility. In contrast to antibodies to A and B antigens, Rhesus antibodies are generally not produced from exposure to environmental antigens. ABO hemolytic disease of the newborn can range from mild to severe, but generally it is a mild disease. rhesus D hemolytic disease of the newborn (often called Rh disease) is the most common form of severe HDN. The disease varies from mild to severe. Other blood group antibodies (Kidd, Lewis, Duffy, MN, P and others). Peripheral blood morphology shows increased reticulocytes. Erythroblasts (also known as nucleated red blood cells) occur in moderate and severe disease. Rhesus-negative mothers who have had a pregnancy who are pregnant with a rhesus-positive infant are offered Rh immune globulin (RhIG) at 28 weeks during pregnancy, at 34 weeks, and within 48 hours after delivery to prevent sensitization to the D antigen. It works by binding any fetal red blood cells with the D antigen before the mother is able to produce an immune response and form anti-D IgG. A drawback to pre-partum administration of RhIG is that it causes a positive antibody screen when the mother is tested, which can be difficult to distinguish from natural immunological responses that result in antibody production. Complications of HDN could include kernicterus, hepatosplenomegaly, inspissated (thickened or dried) bile syndrome and/or greenish staining of the teeth, hemolytic anemia and damage to the liver due to excess bilirubin. Similar conditions include acquired hemolytic anemia, congenital toxoplasma and syphilis infection, congenital obstruction of the bile duct and cytomegalovirus infection. Hemolytic disease of the newborn is most commonly seen in kittens (where it is known as "fading kitten syndrome") and foals. It has also been reported in puppies. Geifman-Holtzman, O; Wojtowycz M; Kosmas E; Artal R (1997). "Female allo-immunization with antibodies known to cause hemolytic disease". Obstetrics and Gynecology. 89 (2): 272–275. doi:10.1016/S0029-7844(96)00434-6. ISSN 0029-7844. PMID 9015034. Mollison, PL; Engelfriet CP; Contreras M (1997). Blood Transfusion in Clinical Medicine (10th ed.). Oxford, UK: Blackwell Science. ISBN 0-86542-881-6.